Cabin #12 is the main house of the Brownies cabin complex. It was recently sold and is now available for rent. It was formerly the owners' residence and at one time, a restaurant. 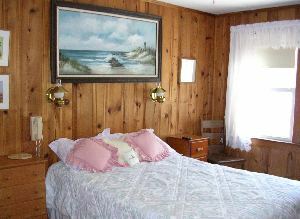 This cabin has two bedrooms, one with two twins, the other with a double. The living room has a pullout couch and the unit sleeps five. 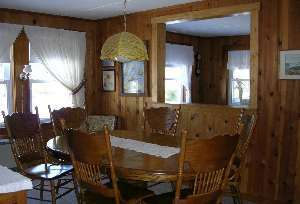 There is a fully equipped galley kitchen, a formal dining room and a utility room with washer and dryer. 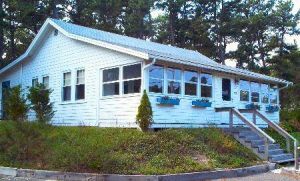 The sunny, enclosed front porch covers the front of the cabin and can be used as a extra living/dining room. There is a grill, picnic table, microwave and dishwasher. Unfortunately, no pets are allowed. NEW IN 2005 - A new heating system was added and upgraded plumbing! If people are interested we would be willing to rent from Memorial Day to Columbus day. Rates would be negotiable and weekends, or shorter stays would be available in the off-season. Copyright©2005 Brownies Cabin Condominium Trust, All rights reserved.